As 2018 arrives, John McDevitt (right), is looking forward to making a comeback with the Fralinger String Band. He and other band members rehearse at Holy Ghost Byzantine Catholic Church in South Philadelphia December 28, 2017. McDevitt joined the Mummers when he was in elementary school and for nearly three decades, he has been a regular in the New Year’s Day parade. But in 2017 he was sidelined by brain surgery. John McDevitt has marched with the Mummers for more than three decades, most of his life. McDevitt, 46, of Wenonah, is making a parade comeback on New Year's Day after a one-year hiatus. A health scare last year kept him on the sidelines. He was recuperating from surgery a week before Christmas 2016 to remove a two-centimeter lesion from his brain. An alto saxophone player, McDevitt plans to rejoin his comrades when the Fralinger String Band struts in the uniquely Philadelphia pageant on Broad Street. Even after 31 years, it never gets old for McDevitt, who participated in his first Mummers in 1983, when he was 12. John McDevitt (left) performs with members of the Fralinger String Band in the summer. "I'm very excited and hyped to be back doing what I'm doing," McDevitt said in an interview from his South Jersey home. "It's just great to be back in the fold." His remarkable year of recovery has given McDevitt a new appreciation for band members, friends, and family who rallied around him during his illness. A mortgage representative, McDevitt underwent several months of chemotherapy and radiation after his surgery. "He had a tough time last year," said Fralinger president Pat Brady. "We are a family, so we take care of each other." A year ago, McDevitt began experiencing migraines. While dropping his son, Matthew, off at day care one morning, the youngster piped up from the backseat: "Daddy, you missed the turn for my school." That along with other signs, including focal seizures, were adding up to suggest something was wrong. McDevitt went to nearby Kennedy Hospital in Washington Township the same day and underwent an MRI. The diagnosis was mind-boggling: a slow-growing tumor on his left optical lobe. He underwent a successful procedure (no cancer was found) and was home to celebrate Christmas with his family. "I really didn't dwell on it or think about it. I took a leap of faith," he said. "Every day was a day of healing." But for the first time in years, he watched the Mummers on television as a spectator; a replacement was tapped to fill his spot. The announcer called his name as the band members dedicated their "Spellbinding" wizard performance to McDevitt. He was flooded with messages as the word spread about his surgery. "It just really, really made me feel good," McDevitt said. "I felt like I was missing out. I felt like a football player on the bench." McDevitt has been playing saxophone since he was a fourth grader at Dwight D. Eisenhower Middle School in West Berlin, where he grew up. He joined the Palmyra String Band at the urging of his music teacher, William Garton, and has been involved in Mummerdom since then, playing in several string bands over the years. John McDevitt performed for the first time up Broad Street with the Palmyra String Band in 1983 (left). He posed with his son, Matthew, at the 2016 parade, with Fralinger, who took 3rd Place that year. "Johnny was special. He always stood out," recalled Garton, 74, of Somerdale, who retired from teaching in 2010. "He has something special for music." Until 2017, McDevitt had missed only two Mummers parades since 1983. He sat out two years, but says he missed the thrill of performing and brotherhood so much that he "ran back to it." He met his future wife, Victoria, also a Mummer, while both were playing with the Trilby String Band in 1995 and married the fellow saxophone player four years later. She retired from the Durning String Band in 2002. Garton said he suggested the Mummers as an extracurricular activity for his protege because he believed the camaraderie and experience would help hone McDevitt's musical skills. McDevitt took private lessons with Garton and was always seeking to become better, he said. 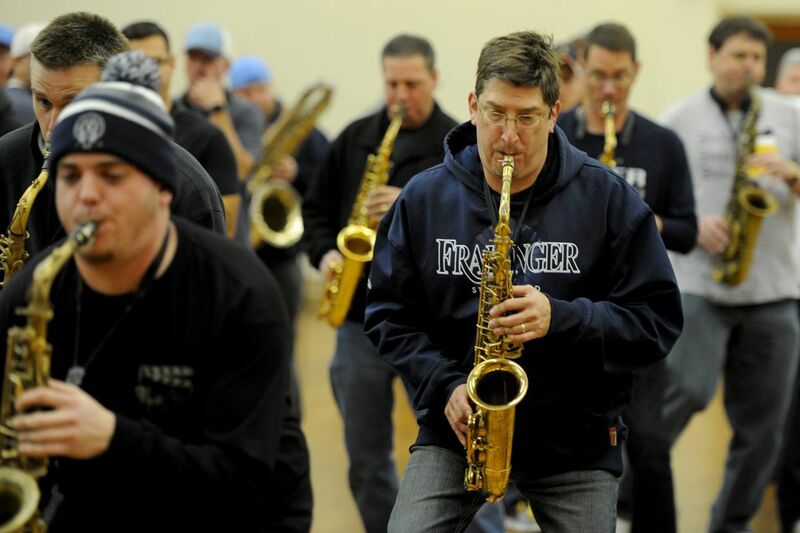 "I always told the kids you're only as good as the people you hang with," said Garton, also a veteran Mummer and saxophone and clarinet player who worked with Fralinger band members from September to December fine-tuning their performance this year to the theme "Movie Chromatic." Garton was among several hundred people who attended a benefit for McDevitt organized by friends to help offset his medical costs. During his convalescence, band members visited him often, dropping off meals and cards and spending time with him. "It's about helping others who need our help in the Mummers community," said Deb Tomaselli, who cofounded Mummers Against Cancer along with her husband, Mike, which presented him with a donation. "We try to help and be there for anybody." Eventually McDevitt returned to work and picked up his saxophone and rejoined the band last summer. He had to get back up to muster to keep step with the band, which is heavy on saxophones, unlike a typical string band. Brady said 48 of the 67 strutters this year will play sax. Because McDevitt missed some band activities during his recovery, his attendance lagged. As a result, he didn't qualify for the top 60 slots on the band, which go to those with the highest attendance. But the musical director selected McDevitt for one of the seven remaining spots, Brady said. McDevitt joined the Fralinger String Band, an old and successful all-male club, about four years ago. It was founded in 1914 by John Fralinger, a Philadelphia physician and pharmacist who was team doctor for baseball's Athletics. The club claimed a record-setting eight consecutive first prizes from 2003 to 2010. It finished second in 2017. "He's one of the best sax players," said Brady. "It's great to have him back. It's pretty amazing."